November 28 is the 332nd day of the year(333rd in leap years) in the Gregorian calendar.There are 33 days remaining until the end of the year. The Treaty of Andelot, was signed at Andelot-Blancheville in 587 between King Guntram of Burgundy and Queen Brunhilda of Austrasia. Based on the terms of the accord, Brunhilda agreed that Guntram adopt her son Childebert II as his successor and ally himself with Childebert against the revolted leudes. Gregory of Tours wrote in his Historia Francorum that in the thirteenth year of Childebert, he went on an embassy for the king from Metz to Chalon to meet Guntram, who alleged that prior promises were being broken, especially concerning the division of Senlis. Significantly to Gregory, the treaty brought about the cession of Tours by Guntram to Childebert. An agreement was provided in writing and Gregory preserves the text of the treaty in his history. Pope Gregory III was Pope from 11 February 731 to his death in 741. His pontificate, like that of his predecessor, was disturbed by the iconoclastic controversy in the Byzantine Empire, and by the ongoing advance of the Lombards, in which he invoked the intervention of Charles Martel, although ultimately in vain. He was the 5th Syrian pope and the 10th and last pope born outside of Europe for 1,272 years, until the election of Pope Francis in 2013. Saint Acacius was a 4th-century priest who lived in Sebaste, Armenia, during Diocletian's persecution. Under the governor Maximus (284-305) seven women and two children were brought to justice in Sebaste. The women were accused of having tempted their husbands to become Christians. They did not lose their dignity even under the harsh torture. One of the executioners, Irenarchus, was so impressed by their attitude to their faith that he joined them. It was the priest Acacius who administered the baptism of Irenarchus. All of them suffered of torture and were killed by the sword or the stake. They are venerated in Orthodox church and their feast day is on November 28. The Feast of the Holy Sovereigns is celebrated annually in the Episcopal Church in Hawaii on November 28. The feast celebrates the founders of the Anglican Church of Hawaii, King Kamehameha IV and Queen Emma of Hawaii. The Anglican Church of Hawaii was originally called the Hawaii Reformed Catholic Church. Flag Day or Independence Day, commonly known as the Albanian Independence day, is celebrated every 28 November as a holiday in Albania, The Albanian diaspora. It refers to the Albanian Declaration of Independence on 28 November 1912 and the rise of the Albanian flag in Vlora, coinciding with the day in which Skanderbeg raised the same flag in Krujë, on 28 November 1443. 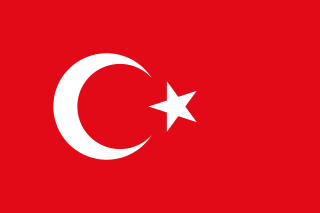 Turkey, officially the Republic of Turkey, is a transcontinental country located mainly in Western Asia, with a smaller portion on the Balkan Peninsula in Southeast Europe. East Thrace, located in Europe, is separated from Anatolia by the Sea of Marmara, the Bosphorous strait and the Dardanelles. Turkey is bordered by Greece and Bulgaria to its northwest; Georgia to its northeast; Armenia, the Azerbaijani exclave of Nakhchivan and Iran to the east; and Iraq and Syria to the south. Ankara is its capital but Istanbul is the country's largest city. Approximately 70 to 80 per cent of the country's citizens identify as Turkish. Kurds are the largest minority; the size of the Kurdish population is a subject of dispute with estimates placing the figure at anywhere from 12 to 25 per cent of the population. ↑ Brooks, Rebecca B. Elizabeth Parris: First Afflicted Girl of the Salem Witchcraft Trials. June 10, 2013. Profile, historyofmassachusetts.org; accessed December 23, 2014. ↑ "Rita Mae Brown". web.archive.org. 2013-05-15. Archived from the original on 2013-05-15. Retrieved 2019-01-29. ↑ "Typing her speaker's script". Mmegionline. ↑ "CATHOLIC ENCYCLOPEDIA: Athanasius Kircher". Newadvent.org. 1910-10-01. Retrieved 2016-12-04. Wikimedia Commons has media related to November 28 .